We’d love your help. 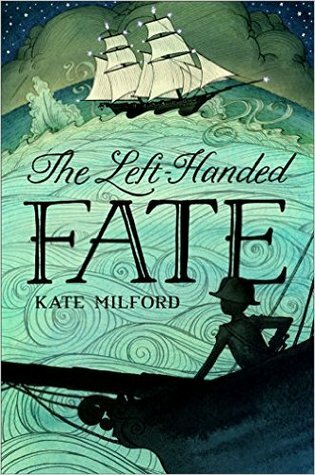 Let us know what’s wrong with this preview of The Left-Handed Fate by Kate Milford. Lucy Bluecrowne and Maxwell Ault are on a mission: find the three pieces of a strange and arcane engine. They're not exactly sure what this machine does, but they have it on good authority that it will stop the war that's raging between their home country of England and Napoleon Bonaparte's France. Despite being followed by mysterious men dressed all in black, they're well Lucy Bluecrowne and Maxwell Ault are on a mission: find the three pieces of a strange and arcane engine. They're not exactly sure what this machine does, but they have it on good authority that it will stop the war that's raging between their home country of England and Napoleon Bonaparte's France. Despite being followed by mysterious men dressed all in black, they're well on their way to finding everything they need when their ship, the famous Left-Handed Fate, is taken by the Americans. And not just any Americans. The Fate (and with it, Lucy and Max) are put under the command of Oliver Dexter, who's only just turned twelve. To ask other readers questions about The Left-Handed Fate, please sign up. What genre would you say this is?? I think it's mystery. Kate Milford is an auto-buy author for me. I love all of her books. The Left-Handed Fate, which I was lucky enough to read an ARC of, is no exception. It has been a long time since I was so thoroughly enraptured with a book and in that mode where I never want to stop reading or leave this world and its characters. Max Ault is attempting to complete his late father's mission to put together the pieces of an ancient puzzle that lead to the b Originally posted here at Random Musings of a Bibliophile. Max Ault is attempting to complete his late father's mission to put together the pieces of an ancient puzzle that lead to the building of a magnificent machine-a machine that will have the power to end all wars. Lucy Bluecrowne is a privateer determined to help Max complete his mission and continue her family's legacy of honor and commitment. Oliver Dexter wants to live up to the legacy of his famous ship captain father and not embarrass himself as a midshipman turned captain of a prize vessel. Liao Bluecrowne just wants everyone to stop fighting and let him make fireworks in peace. Together these four headstrong determined characters have to dodge the most undiplomatic of French diplomats, outrun mysterious pursuers dressed in all black whose ship seems to appear out of nowhere, navigate the mysterious unexplainable port of Nagspeake, and deal with betrayals, plots, and politics. Most importantly they have to learn to trust each other and work together before they all lose everything they are working hardest to hold on to. The plot is fast paced. There is really no peace at all to be had while reading this book. The end of each chapter just left me wanting to know more, desperate to see what happens next. I've made no secret of how little I tend to enjoy books that take place on boats. I had no trouble with this here. There was exactly enough about ships for me to be firmly set in the world without making me want to go set fire to an entire fleet out of sheer frustration if I got one more detail about how ships work. This is a fine balance no other author writing about boats has managed for me. Milford does a fabulous job of showing life on ship and also the bringing to life the town of Nagspeake, which is changeable and hard to pin down. I was fully immersed in the world she created from beginning to end. The story takes place during the War of 1812 shortly after America's declaration of war. The Left-Handed Fate is a British privateer vessel. Oliver is a midshipman in the US Navy. Max is doing what he is doing to help Britain stop the advance of Napoleon. I appreciated how well Milford added historical details including how complicated the politics of all this were at the time. Max has a line about how inconsequential the American war is in comparison to Britain's problem with Napoleon. (True.) She also manages to include how awful and unfair impressment and the British seizing of America's ships was. (Also true.) She does this deftly, not turning her plot into a history lesson. It is simply part of the world and who these characters are. These issues color how the characters see each other, how they choose their words, and what actions they take. At the fear of repeating myself too much, it is BRILLIANT. I am labeling this as Middle Grade because that's how it is being marketed, but truly it is one of those books that defies age category. (Okay, that's also a trademark of Kate Milford's books. She is in the same category in my head with Diana Wynne Jones, Elizabeth Marie Pope, and Megan Whalen Turner that way.) Child. Teen. Adult. Who cares? Enjoy a good adventure with politics and characters who will feel like family? Then this book is for you. Look: this is, objectively speaking, a decent book. Even a good one. But it's somehow both clinically good and a confusing jumble. The plot is messy, but it's covered in a veneer of competent storytelling. I don't want competence, though. I want an immersive experience. I want a story greater than the sum of its parts. I want something that reaches for the heights of Greenglass House, something ambitious and exciting and urgent. Instead, I get a treasure hunt (that's a theme Milford plays with in Look: this is, objectively speaking, a decent book. Even a good one. But it's somehow both clinically good and a confusing jumble. The plot is messy, but it's covered in a veneer of competent storytelling. Instead, I get a treasure hunt (that's a theme Milford plays with in a few books) and fireworks (same) - only here I'm supposed to believe the treasure hunt is more than a treasure hunt and the fireworks are more than fireworks. And I don't. Also, I'm left wondering why people treat these characters as adults when all I'm shown from their points of view, over and over, is just how young they feel and consequently behave. This isn't a flaw in and of itself, but it is a contradiction when people don't notice their less-than-adult perspectives and act instead as if nothing is amiss. The main problem I have, though, resembles the problem I had with The Broken Lands: too many big ideas are dumped into the narrative and given short shrift. Between the orphans, the treasure-hunt-that-can-end-everything, the convenient independent principality with its growing metal and wandering streets and frustratingly unsurprising madhouse, and the very real war, neither the fantastic aspects nor the horror of the war of 1812 are properly developed. The characters, who are supposedly propelled by these elements, suffer as a result. There are also ahistorical details, mostly about the treatment of women at the time, that border on preachy and are awkwardly linked to the treatment of children at the time; I ignored them. "When you call things 'fairy tales,' you mean stories for children, in which fantastic things stand in for real ones and some sort of truth hides behind a wondrous fiction, yes?" Lucy Bluecrowne is the daughter of Captain Bluecrowne of the Left-Handed Fate and privateer. Lucy and her little brother Liao love their life at sea. It's all Lucy has ever known though Liao remembers living in China with his mother. The ship and crew are sailing the Atlantic in search of French ships and also searching for a mysterious machine part. Max Ault is determined to finish the job his father, a natural philosopher, started and bring about an end to the war between Britain and France. Max has one part of the machine and the next is hidden in Baltimore. Unfortunately for the ship's crew, America has just declared war on Britain so it won't be easy navigating Baltimore as British subjects. If Max wants to succeed he has to talk his way past a nervous shopkeeper, seek help from a young American acting Lieutenant (U.S. Navy), rely on Lucy and Liao to help rescue him from his own clumsiness and avoid some mysterious sailors in all black who only appear after seeing mysterious purple lights. Can a quartet of children figure out the solution to the mysterious machine that will end war forever? This story is a light fantasy novel for older middle grade readers/young adults set during the War of 1812. It's a time period not many people know about from the American perspective outside of key areas like Baltimore. I was really intrigued to see how the war would affect the characters. The plot was interesting but I felt it wasn't as unputdownable as I had expected. It felt a little too slow moving in the beginning. I dropped my rating because of an excessive battle scene involving a lot of carnage. That was a bit too much for a middle-grade book. It was confusing after that to figure out who was on which ship and who was an ally of Lucy's and who was not. That becomes much more ambiguous as the story goes on. Once they get to Nagspeake the story becomes a lot more interesting. I just loved the description of Nagspeake. It's so fantastical and amazing. I loved the living iron "philosophical iron" and the bazaar. The author did an amazing job world building. I dropped my rating a bit more because the moral was hammered home. I also really liked the strong female characters in this novel. Lucy has spent her entire life at sea and she can be a bit tough but she also has a heart. She is capable of feelings and emotions that all teen girls experience. She has a lot to deal with in this novel and I really liked her. Lucy is a bit bossy at times but she is a natural leader and gets things done in her own way. Nell Levinflash is the other strong female character. She's a leader like Lucy but unlike Lucy, she doesn't seem to have emotions. She does what she has to do to protect her home and while I found her ethics a bit dubious, I did appreciate her character. Another strong female character is The Mad Spinster. She's a minor character but crucial to the plot. I loved learning about the history of weaving. I don't believe she is truly mad but perhaps elderly and a bit too consumed by her work. The male characters here are all very different but quite as endearing as the females. Max is a gawky, awkward teenage boy who wants to do the right thing but is unsure of what to do. I loved his clumsiness and how he figures out what to do at the end. Liao is adorable. He is so sweet and loving. He reminded me of my niece "E". They're the same age. Liao embodies the sweet innocence of young children. His pyromania made me a bit nervous but I liked how he only used it for fun and for helping a friend in need. Oliver Dexter, age 12, is an eager young lad, determined to go to sea and follow in the footsteps of his hero. (Is he named after Oliver Hazard Perry, hero of the War of 1812?) When he finds himself in over his head he behaves as any other young teen boy would. I really liked his character development and how Lucy points out his positive traits. Britain had better look out! The adult males are not as well-rounded as the children because obviously this book is intended for children. Like the Series of Unfortunate Events, the children are smarter than the adults. Lucy's father seems indulgent of her and a loving father. He's a tough Captain but fair. The crew members aren't fleshed out much. Mr. Cascon is Oliver's trusted friend and father-figure. I didn't trust him at first but his story is tragic and horrific. Of Lucy's friends, only Harrick really becomes part of the story and he basically exists in the background to move the children from point A to point B. The crew of the LHF are like Lucy's family so I'm sure I would like them. They're certainly loyal. Then there's the villains from France who also want the same machine Max is after. Cloutier and Voclain are a bit stereotypical. They're single-minded in pursuit of stopping the British without thought to consequences. The author refrains from making them cartoonish at least. The mysterious men in black are a bit scary. They surprised me a lot. I enjoyed this novel enough to want a sequel! I'd like to know how things turned out for Oliver and what Lucy gets up to next. Horatio Hornblower 1 - 11. I lived in Fell's Point, where The Left-Handed Fate begins, and still consider it home. To find it captured in time between these pages, and well in the grip of plots and contorted mechanisms was a complete joy. More soon, once I wrest the book back from a young friend. I was all set to love this, because Greenglass House is one of my favorite books of the last few years (and because 18th century sailing ships but with steampunky magic!). Unfortunately I found the first half a slog. The characters are chasing around after a few plot coupons, other non-point-of-view enemy characters are chasing after them as well... basically everyone was shuttling back and forth around Baltimore Harbor firing at each others' ships and boarding each other, and the stakes were to I was all set to love this, because Greenglass House is one of my favorite books of the last few years (and because 18th century sailing ships but with steampunky magic!). Unfortunately I found the first half a slog. The characters are chasing around after a few plot coupons, other non-point-of-view enemy characters are chasing after them as well... basically everyone was shuttling back and forth around Baltimore Harbor firing at each others' ships and boarding each other, and the stakes were too mysterious for me to care. I persevered because I trust Milford, and the book did pick up for me when they arrived in the strange city-state of Nagspeake (also the setting of Greenglass, 200 years later). Her gift for creating quirky, cozy settings with a hint of danger was able to shine there -- I can read about Nagspeake hot cocoa and jam all day. This book is very, very well-written. Not a book I would ever normally pick up (maritime adventure?! No, thanks), but definitely worth the ride. Lots of adventure, strong female characters, delightful world-building, and all-around fun. A great recommendation for those kids who are reading on a level that puts them outside the children's room, but aren't ready for a lot of the content of YA. Really interesting way to move the series forward. I can't wait to read more about what this series is actually about and who those mysterious black-on-black sailors are. I say this a lot but I'd love to see this adapted for TV or movies. I really enjoyed this book. The plot was interesting, the characters were well fleshed out. The only problem was that the battle was extremely confusing -- too many ships, so it was impossible to keep track of the action. I thought that this was a pretty good book with nicely developed characters and an interesting plot. However, at times it was quite confusing, and to me it seemed like the story moved very, very slowly up until the end where it moved extremely quick. Wonderful story about the privateer ship the Left-Handed Fate and her crew- primarily Lucy Bluecrowne. Kate Milford is an amazing story teller! This one took me a little time to get into it, but once I did, I was hooked and couldn't wait to see what would happen in the end. Great book for boys or girls who want adventure on the high seas during the War of 1812. This book was a lot more than I bargained for. Honestly, it was one of the more difficult reads I've endeavored to review for NetGalley, but the experience was well worth the effort. This is a story set against the backdrop of the War of 1812, one that seemed to pick up right in the middle of the action. There's backstory that the reader will have to come to understand on their own to truly appreciate what's happening. In reality, this is the story of four different characters, all in their early teenage years, all with a unique history and unexpected connections to one another. There is Lucy Bluecrowne, daughter of the captain of The Left-Handed Fate; Maxwell "Max" Ault, son of a scientist that hired The Left-Handed Fate to help him in a mission of worldwide importance; Liao, Lucy's pacifist brother who is obsessed with fireworks and pyrotechnics of all sorts; and Oliver Dexter, who at age twelve is starting his naval career as the son of a high ranking American naval officer while trying to live up to his father's amazing reputation. Readers should note that this book would be much easier to understand if you have read Bluecrowne first, something that I was not aware of before reading. In fact, I'd never heard of Bluecrowne, but the nature of the story made me wonder if this was not the first adventure for some of the characters. Lucy and Liao are definitely in Bluecrowne, though I haven't read it, so I don't know if Max is. I don't think Oliver Dexter is, but I could be wrong. Anyway, Max is on a mission to gather the pieces of what they assume is a weapon that can stop Napoleon Bonaparte from taking over the world. His father died trying to achieve that, and now Max is taking up where he left off. Lucy and her father are helping them because they agreed to do so, and they are honor bound to keep their word. Liao just seems to be along for the ride, though his mastery of pyrotechnics makes him a handy accomplice in their mission. They are in U.S. waters in the Chesapeake Bay just as the war of 1812 breaks out and they are commandeered by the ship on which Oliver Dexter is a crew member. He becomes the prize captain of The Left-Handed Fate, meaning he is put in charge of the ship because the ship he was on defeated The Left-Handed Fate in battle. Lucy's father is killed in battle, and Lucy is the new captain of the ship by default, so she has to hand over The Left-Handed Fate to Oliver Dexter, who very quickly realizes that he is in way over his head. The French are after what Lucy and Max have on board and attempt to force Oliver to comply with their wishes, which goes against naval code since France and America are allies. This makes for a strange sort-of alliance against their new common enemy. There's also a weird ghost ship that doesn't belong to anyone's navy that has been trying to capture The Left-Handed Fate for their entire journey. It keeps showing up out of the blue and attacking. They end up docking in Nagspeake, which Kate Milford apparently writes into a lot of her books, and the adventure just keeps getting more and more complicated. All in all, though this book is going to be marketed as a middle grade read, I don't think that many middle grade readers will be up to the task. However, that upper-echelon of middle grade readers and a sizable portion of the young adult crowd could probably follow and enjoy this. I liked it a lot. I couldn't picture more than a handful of the kids in my elementary school who would have been up to it, but maybe in their middle school years they could. This belongs to the group I call tweens, ages 10-15. My name is Max, and I must find the second piece to a devastating weapon that could end a budding war and prevent others. I only have cryptic clues about its capabilities, but I can't let it fall into Napoleon's hands. Lucy and the crew of the Fate helped me find the first part, but locating the second one has become an adventure. The Americans and Britain are now at war, so it makes sailing the Atlantic more treacherous. A mysterious brig has been materializing along with eerie lights, and we'v My name is Max, and I must find the second piece to a devastating weapon that could end a budding war and prevent others. I only have cryptic clues about its capabilities, but I can't let it fall into Napoleon's hands. Lucy and the crew of the Fate helped me find the first part, but locating the second one has become an adventure. The Americans and Britain are now at war, so it makes sailing the Atlantic more treacherous. A mysterious brig has been materializing along with eerie lights, and we've only barely managed to escape. Now, the Fate has been overtaken by an American ship and is being controlled by a very young lieutenant. He's helping us protect the first piece of the weapon, but we'll soon be without a ship and on our own. Although The Left-Handed Fate isn't my favorite of Milford's tales, it's another strong addition to the shared universe of her books. The story follows Lucy and Liao as their father's ship, the infamous Left-Handed Fate, is caught up in a dangerous mission to find the three parts of an ancient mechanism that could be a weapon to end all wars. Following the clues held by Max, a young philosopher who's still finding his sea legs, the crew of the Fate gets more than it bargained for as they're force Although The Left-Handed Fate isn't my favorite of Milford's tales, it's another strong addition to the shared universe of her books. The story follows Lucy and Liao as their father's ship, the infamous Left-Handed Fate, is caught up in a dangerous mission to find the three parts of an ancient mechanism that could be a weapon to end all wars. Following the clues held by Max, a young philosopher who's still finding his sea legs, the crew of the Fate gets more than it bargained for as they're forced to contend with the War of 1812, a young prize-captain, and a mysterious black ship that seems to appear out of nowhere. Milford, Kate The Left-Handed Fate, 372 pages. Henry & Holt Company, $17. Language: PG (6 swears 0 ‘f’); Mature Content: G; Violence: PG. Lucy Bluecrowne and her father Captain Bluecrowne own the privateer the Left-Handed Fate. Lucy has grown up on the boat with her adopted brother Liao. Max Ault and his Father hire the boat to find three pieces of an engine that could end the war of 1812 raging between France, America, and their home country Britain. Max's father passed away and it was up t Milford, Kate The Left-Handed Fate, 372 pages. Henry & Holt Company, $17. Language: PG (6 swears 0 ‘f’); Mature Content: G; Violence: PG. Lucy Bluecrowne and her father Captain Bluecrowne own the privateer the Left-Handed Fate. Lucy has grown up on the boat with her adopted brother Liao. Max Ault and his Father hire the boat to find three pieces of an engine that could end the war of 1812 raging between France, America, and their home country Britain. Max's father passed away and it was up to him to find the parts to the engine but plans change when him and Lucy get captured by another ship with a twelve year old boy as captain. When Oliver, the captain, finds out what Lucy and Max are doing he is torn between the two sides. I liked the character growth in this story and how the main characters had to change to accomplish their mission. There were some action scenes that moved slowly and it took a while to really get the plot going. This book was not as good as I had expected. This came from my library's juvenile shelves; there are a dozen or so pages of nice illustrations. The story's scaffolding seems solid enough, and occasionally it brings you to an interesting place, but getting from plot point A to plot point B tends to be a mushy and less than fascinating process. Revelations don't feel like they happen for any good reason except that it's gotten to be a few pages and it's time for another step in the slow unveiling of the concept. Point of view jumps around re This came from my library's juvenile shelves; there are a dozen or so pages of nice illustrations. The story's scaffolding seems solid enough, and occasionally it brings you to an interesting place, but getting from plot point A to plot point B tends to be a mushy and less than fascinating process. Revelations don't feel like they happen for any good reason except that it's gotten to be a few pages and it's time for another step in the slow unveiling of the concept. Point of view jumps around recklessly, the better to mask the non-progression of events. The denouement is a bit of, to coin a phrase, a machina ex deus. (That's probably not proper Latin grammar, but you probably can guess what I mean.) She spends the whole book foreshadowing her fantasy element yet doesn't remember to prep us for the little romance she wants kindled until it's too late for us to buy it. I have to admit, I decided I wanted to read this book for crazy reasons. I am left handed and the title grabbed me, then the gorgeous cover did the rest. I did check it out on goodreads first to make sure I would like it, but my heart was already 99% set. When I started this book I didn't realize it had elements of fantasy in it. That led to a lot of me wondering what the heck was going on, and also to me loving it more. How do I even explain characters as amazing as Lucy, Liao, Max and Oliver? Ea I have to admit, I decided I wanted to read this book for crazy reasons. I am left handed and the title grabbed me, then the gorgeous cover did the rest. I did check it out on goodreads first to make sure I would like it, but my heart was already 99% set. How do I even explain characters as amazing as Lucy, Liao, Max and Oliver? Each one had such heart. Lucy, trying at all moments to be more grown up than she is. Liao, who brings sure pure joy to every moment. Max, who was always so afraid, yet so steadfast on his determination. Oliver, who at all moments, just wanted to be doing the right thing. The bringing together of the device is story poetry. I love how all of the pieces are slowly woven together so you get a chance to guess at what it will be. I kept hoping it would end up exactly as it did. Did I like this as much as 'Greenglass House'? No. But did I still enjoy it? Yes. A simple story, with fun characters and a bit of magic. Milford has that ability to really make you feel like you're in the world she creates, that these characters are your friends and comrades, and that you're actually there on the boat with the ocean spray hitting your face or you're in a town that defies the physics of the rest of the world. So this book definitely had that. However the reveal of the machine was Did I like this as much as 'Greenglass House'? No. But did I still enjoy it? Yes. A simple story, with fun characters and a bit of magic. Milford has that ability to really make you feel like you're in the world she creates, that these characters are your friends and comrades, and that you're actually there on the boat with the ocean spray hitting your face or you're in a town that defies the physics of the rest of the world. So this book definitely had that. However the reveal of the machine was a bit of a let down, and she introduced some very fun ideas that I would have loved to see expanded (ie - the insane asylum run like a country by its inhabitants), but if she returns to this world she can always do that then. I love Kate Milford's Greenglass House and was excited for this return Nagspeake. However, despite a starred review from Kirkus, I found The Left-Handed Fate harder to get into. The early chapters missed much of the world building that I appreciated from Greenglass House. If you enjoy historical fiction, try this for a nice change of pace. I, though, will await the forthcoming Ghosts of Greenglass House with bated breath! Read with Little Frog Workshop. Pro's: gorgeous figurative language; a rich, full imagined world; lots of heart. Con's: a bit too much going on made for some confusion, scores of characters and changing settings. Reads older than a middle grade novel. This book was a pleasure and I plan to read more Kate Milford. I am so in love with this world that Kate Milford has created! I loved being on The Left Handed Fate. I loved visiting Lucy and Liao again. I loved the new characters of Max and Oliver. I loved learning more about Nagspeake. This is just wonderful! If you like light fantasy, adventure, or 19th century ships, you will really enjoy this. Max's Father was trying to get the three pieces of machinery that will end the war. Trying to retrieve the first part proved tobe his demise. So it is up to his son to continue with this hunt. It won't be easy with the French, America, men in Black and the Royal navy after the same thing. Very slow going. Too many nautical terms. Pitting me to sleep. Having read The Greenglass House and it’s sequel, I was excited to see more from Kate Milford on the library shelf. This book shows her detailed, multileveled style but I had difficulty getting into it due to the intricacy of the nautical terms. Context clues helped but in the end it was a bit of a battle to get through. Kate is the author of THE BONESHAKER, THE BROKEN LANDS, GREENGLASS HOUSE, and the forthcoming THE LEFT-HANDED FATE (Fall 2015). She is also the author of the self-published Arcana Project series. The first two volumes, THE KAIROS MECHANISM and BLUECROWNE, can be purchased for e-readers at all the usual outlets and in paperback from www.clockworkfoundry.com or www.mcnallyjackson.com. The third volu Kate is the author of THE BONESHAKER, THE BROKEN LANDS, GREENGLASS HOUSE, and the forthcoming THE LEFT-HANDED FATE (Fall 2015). She is also the author of the self-published Arcana Project series. The first two volumes, THE KAIROS MECHANISM and BLUECROWNE, can be purchased for e-readers at all the usual outlets and in paperback from www.clockworkfoundry.com or www.mcnallyjackson.com. The third volume, THE RACONTEUR'S COMMONPLACE BOOK, will be released in winter of 2014.